The Robotics course is intended to provide 6 ECTS for participating in the Robotics Club activities. From September until November of 2017 the main focus is to get two basketball robots and four sumorobots ready for Robotex 2017. Basically attend lectures, pick any of the suggested tasks/projects, confirm with Lauri and earn your ECTS. 7. September 14:00-15:30 room 410 in College building - Introduction of Robotics Club, it's equipment, capabilities and resources. Recap of last year, take a look at running projects. 28. September 14:00-15:30 room 410 in College building - Powering circuits, work safety, measuring tools, form teams for Robotex 2017.
should it turn at first chance? or go as far as possible, then come back and try the first turn on its way back? 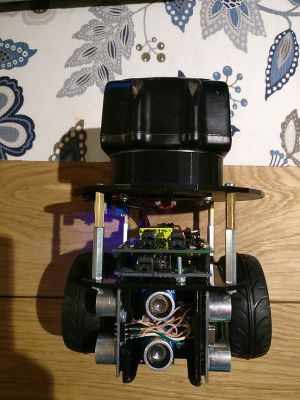 We made a first simple prototype with a bought chassis, Arduino Uno, 3x ultrasonic sensors and optical RPI-579 sensors for wheels. As it quickly turned out, it was really hard to get the driving and turning right without seeing the sensors' realtime data. So we needed a way to see the Arduino's serial monitor wirelessly. At the moment there's 2 good choices for a controller that has a wireless on board - Arduino YUN and ESP32. YUN is much more expensive, ESP seems more complicated to program. As I just happen to have a YUN lying around, it's our current choice to go on with the project. We have a second prototype with 3D printed chassis. All the hardware should be the same that will be used on a final version. Henri accidentally drew the chassis a bit too big, so for the final version we need to print a new chassis. At the moment we're able to read the HC-SR04 and Hall effect sensors inside the motors and make it move as we want. The ultrasonic sensors aren't the best choice, because they are slow, but they're easy to use. 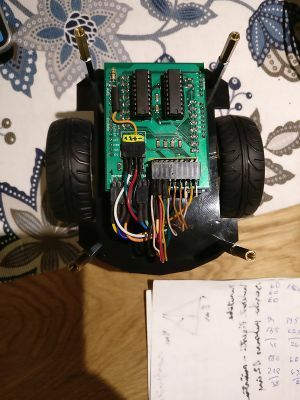 The next steps would be building a real life maze with some turns to calibrate the moving and sensor reading in order to get it drive straight, turn exactly 90 degrees and, if necessary, adjust its position. Some photos and videos can be seen here in Google Photos. And it has a name! Jõmmu. A week before competition we built a completely new unit. 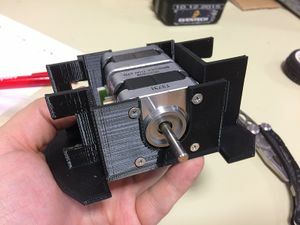 The main problem was that the previous one was too big, and we couldn't get it any smaller with the MAXON's motors. Madis had some NEMA17 steppers lying around, and so we decided to test them. 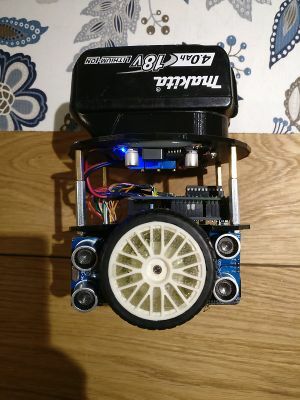 We made an custom Arduino-shield to accomodate dual stepper drivers and all necessary connections. The PCBs were ordered from Elecrow. It took 8 days to get them manufactured and shipped with DHL to Estonia. 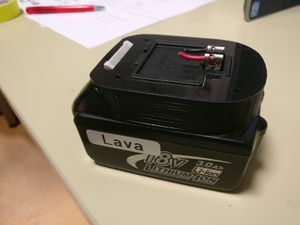 The Makita battery holder's model was found from here. 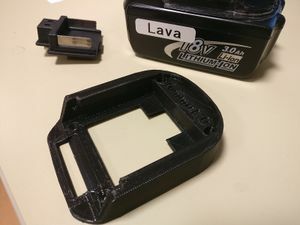 3D printed frame with motors. This page was last edited on 28 November 2017, at 17:25.